The G4 100 series is a simple, flexible and reliable solution for live-sound vocal miking. 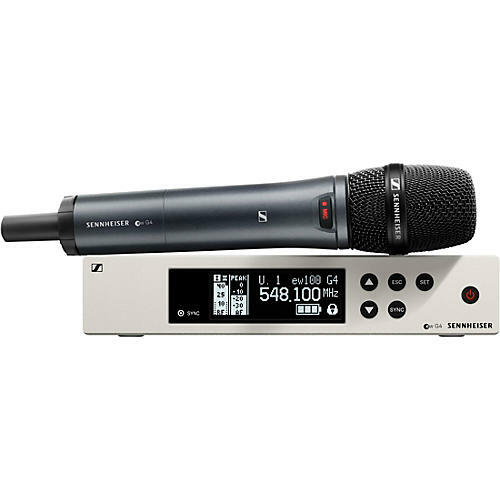 This wireless system pairs Sennheiser's ew 135 G4 receiver with the SKM 100-G4-S transmitter microphone. In this set, the SKM 100-G4-S comes with an e 865 capsule. Together, this powerful wireless system broadcasts professional vocals on stage. The e 865 is an electret condenser microphone with supercardioid pickup. Its made for live performances and lead vocals and easily cuts through levels on stage. It has a detailed and natural 40 Hz - 20 kHz reproduction and superb transient response. The 865 has a rugged and reliable metal construction, a shock-mounted capsule and hum-compensating coil. The shock-mounted capsule means the mic is not that sensitive to impact and handling noise so its perfect for dynamic environments where a mic is being moved and handled. The supercardioid polar pattern ensures the mic stays insulated from other on-stage signals and feedback while the hum compensating coil reduces electrical interference.